Best ever Creamy BROCCOLI CHEESE SOUP. 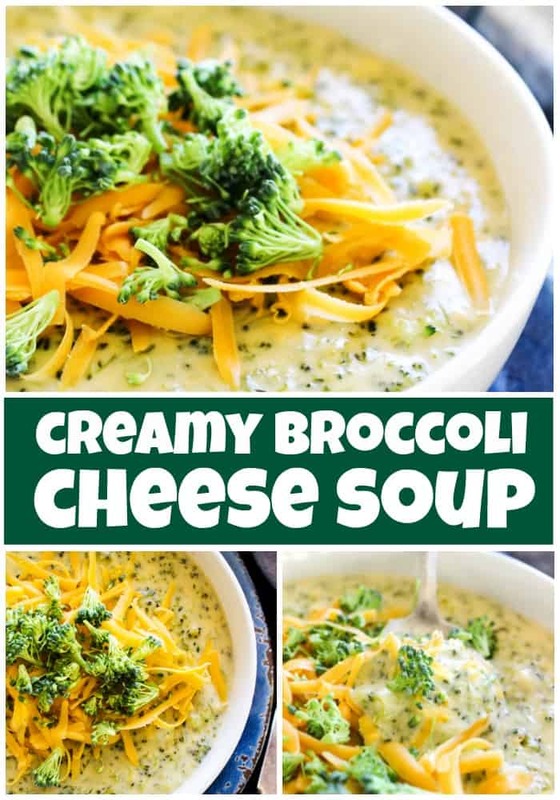 Made with fresh broccoli and three kinds of cheese; this recipe is easy, simple and ready in 45 minutes. This Creamy Broccoli Cheese is super simple and super delicious! It’s awesome for a cold wintery day! These cold winter months are always a great time to whip up a warm bowl of soup. It’s the best kind of comfort food, especially after the holidays where I had my fill of big, over the top meals. I just like the simplicity of soup and salad meal combination whether it be for lunch or dinner. This recipe came from my Aunt Dana. Now I have a few of her recipes on my blog and every recipe has become a staple in our home because we love them that much. 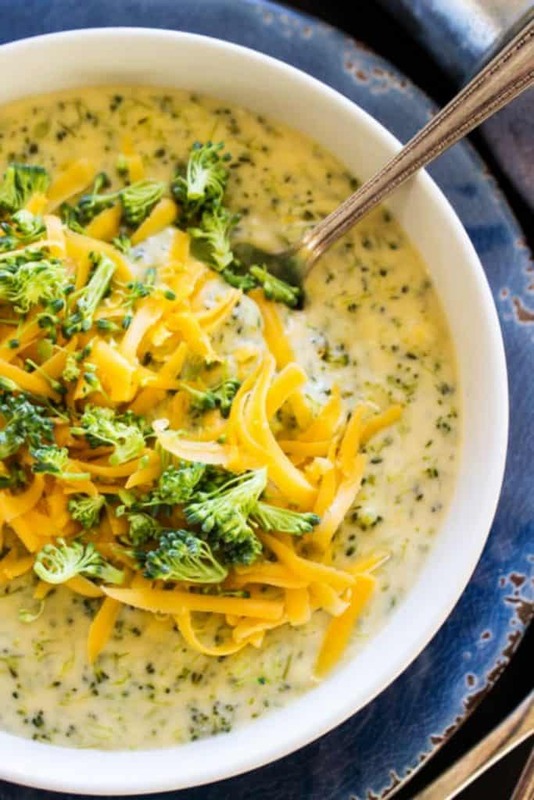 Besides this recipe for CREAMY BROCCOLI CHEESE SOUP we also love her spaghetti sauce. Both recipes are in the Top 20 in our family and each are divine. Now I will be honest I was a little hesitant of this soup because it did require some Velveeta. I was worried the Velveeta would over power the soup, but then again it does only require 1/4 of a block, 8 ounces and it didn’t overtake the flavor. Instead it was a perfect balance with the cheddar and cream cheese and adding the perfect amount of creaminess. My daughter Jersey, loves broccoli! I mean to the point that this last year her aunt and uncle gave her broccoli for her birthday and she was thrilled about it! THRILLED! The lunch lady at our school everytime I see her comments on how much Jersey loves broccoli and that she has never seen a kid eat so much broccoli, she is right. Now I can’t say the same thing for my other 4 kids, but they will tolerate it in casseroles, like my Broccoli Chicken Curry Casserole or in this soup. My husband is the same way and claims he dislikes anything with cooked broccoli, of course that casserole and this soup are the exception. My entire family licks every last it from their bowl, Madden how claims that this isn’t his favorite still wiped the bowl clean with this french bread. I guess cheese, lots of cheese will make anything edible. In a medium pot make a white sauce melting ½ cup butter over medium-high heat. Once flour is melted stir in flour until combined, stir in milk. Continuously stir until there are no visible chunks. Let it simmer over heat until it starts to boil, once it is boiling add in cream cheese and Velveeta. Stir until creamy and smooth and no visible chunks. In a large pot bring 3 cups of water and bouillon cubes to a boil. Once the water is boiling add in chopped broccoli and onion. Boil for 10-12 minutes, until 2/3 of the water has evaporated and the broccoli is tender, just eyeball it. Reduce heat to medium and add the sauce you made above to the broccoli & water pot, stir until combined. At this point it will look very watery, don’t freak out. It will be okay! Bring to a slow boil and cook for 15-20 minutes, stirring frequently so that it doesn’t stick to the bottom. In addition, if you like it extra cheesy, stir in a cup of sharp cheddar cheese, grated. Once it has simmered for about 20 minutes, remove from heat, let it sit for 5-10 minutes, it will thicken up at this point. Serve with rolls or in a bread bowl. If your soup is too thin, add a few teaspoons of flour and whisk until combined. 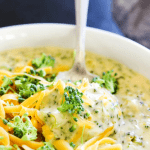 My favorite kitchen items to make this CREAMY BROCCOLI CHEESE SOUP are below, you will want of few of these just for your everyday cooking. 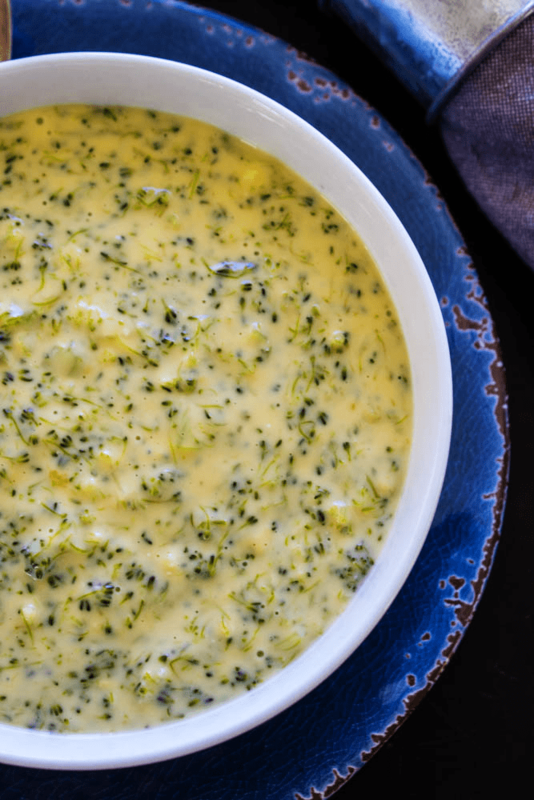 Don’t forget to pin this recipe for CREAMY BROCCOLI CHEESE SOUP to your favorite Pinterest board for later. Best ever BROCCOLI & CHEESE SOUP. Made with fresh broccoli and three kinds of cheese; this recipe is easy, simple and ready in 45 minutes. In a medium pot make a white sauce melting ½ cup butter over medium-high heat. Once flour is melted stir in flour until combined, stir in milk. Continuously stir until there are no visible chunks. Let it simmer over heat until it starts to boil, once it is boiling add in cream cheese and Velveeta. Stir until creamy and smooth and no visible chunks. Remove from heat and set aside. In a large pot bring 3 cups of water and bouillon cubes to a boil. Once the water is boiling add in chopped broccoli and onion. Boil for 10-12 minutes, until 2/3 of the water has evaporated and the broccoli is tender, just eyeball it. Reduce heat to medium and add the sauce you made above to the broccoli & water pot, stir until combined. At this point it will look very watery, don’t freak out. It will be okay! Bring to a slow boil and cook for 15-20 minutes, stirring frequently so that it doesn’t stick to the bottom. In addition, if you like it extra cheesy, stir in a cup of sharp cheddar cheese, grated. Once it has simmered for about 20 minutes, remove from heat, let it sit for 5-10 minutes, it will thicken up at this point. Serve with rolls or in a bread bowl. This post was recently updated from it’s original post date of January 2015. This looks fantastic! 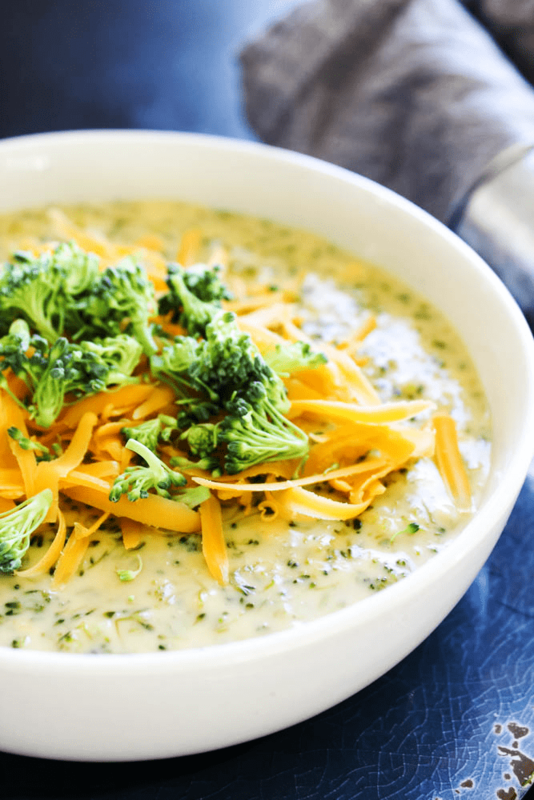 We love broccoli cheese soup…pinning to try it! You always have such drool worth recipes and photos, this one included. 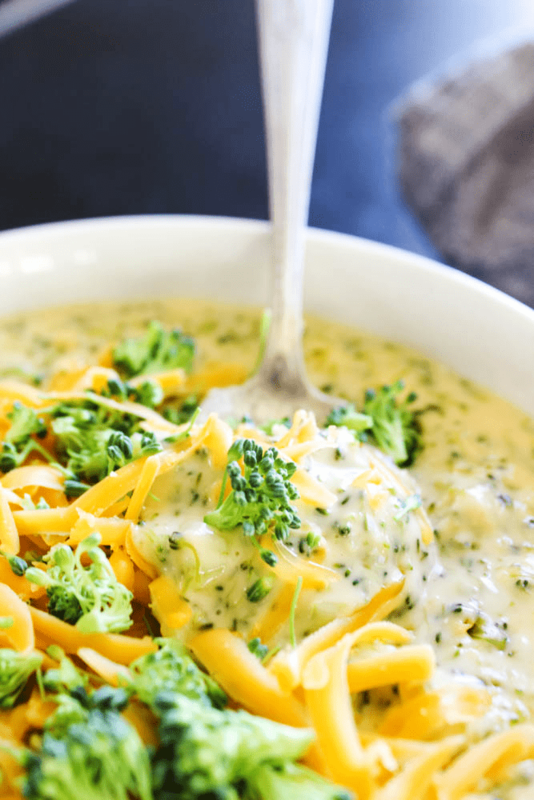 I just love the creamy cheesiness of a good broccoli cheese soup and this looks perfect! This has been declared a new “Family Favorite”! Not a fav of Velvetta so I swapped in a different cheese and we also added carrot. Such a warm and wonderful way to end the day. Thank you. Oh the warmth and creamyness of this soup. All the flavors together are awesome. My whole family loves it. Thanks it will one of our weekend meals forever. Oh the warmth and creamyness of this soup. All the flavors together are awesome. My whole family loves it. Thanks it will be one of our weekend meals forever. Would love to try this recipe but was wondering if there is a substitute I could use instead of the Velveeta cheese? I’ve tried sooo many recipes in my search for the perfect broccoli cheese soup recipe!! Finally, the keeper! Thank you! Wonderful recipe! My family loved it. I didn’t have velveeta, but used a few slices of American cheese and leftover boursin garlic and herb cheese spread! It worked out great and added a few herby notes. I love Boursin cheese so I am loving this idea. Hi, I can’t get Velveeta around here (I live in Canada’s far north). Can I substitute? One of my favorite soups! The more cheese the better! I totally agree! Hope you enjoy, thanks! That looks really creamy! I love it! Wow this looks seriously AMAZING! 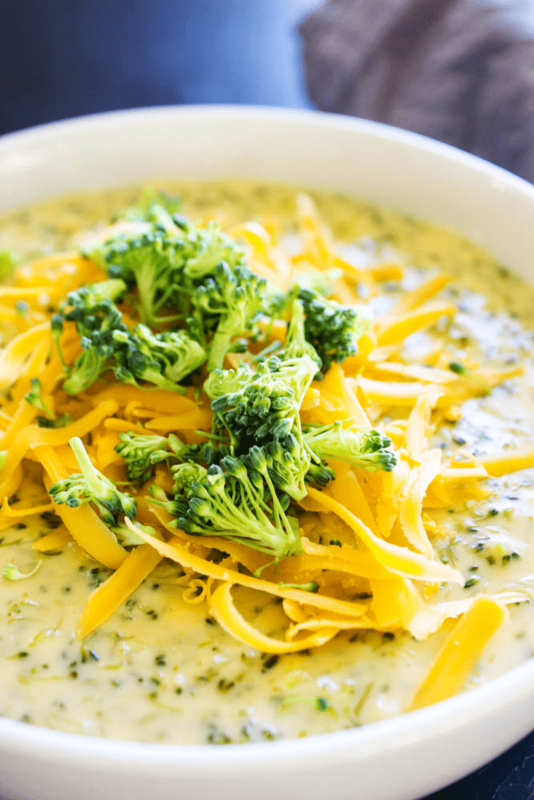 Broccoli cheese soup is the ultimate in comfort food! One of my favorite soups, such a delicious classic! This is such an amazing comfort food!! Looks so comforting and delicious! Perfect on a cold night!